Italian snow and ice specialist Industrial Frigo now utilises its extensive knowledge to provide turnkey solutions worldwide. The company can provide the whole project, including concept, set up, theming of each attraction, features, services, transit routes and signage, detailed design of every object, definition of dimensions, construction materials, internal load-bearing structures and final decoration. 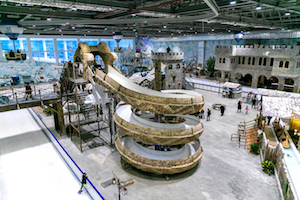 The company's products, which include ice skating rinks, frozen slides, ice tracks for bumpers and minicars, snow playgrounds and snowhills, are suitable for adults and children, for both leisure and sport, and can be built in indoor and outdoor environments. They also function at temperatures of up to 15 degrees Celsius.